Diamond Head, The Video from Glennia Campbell on Vimeo. Last week, Alex attended DayJams Music Day Camp in Menlo Park. He signed up for drums, and although he had never played drums before in his life, he performed on Friday. The camp focuses on Rock & Roll, and each camper chooses and instrument to learn during the week. They do lessons, and each camper is assigned to a band made up of other campers at their level, and a "manager" who is one of the music teachers or camp counselors. They work together to write a song, practice it, and perform it at a concert at the end of the week. The band chose the name "Diamond Head," made t-shirts and backstage passes, and practiced hard through the week. I was somewhat amazed that Alex learned so much in so little time. He can't wait for next year! I had the opportunity to hear former Vice President Al Gore speak last night at City Hall in San Francisco. 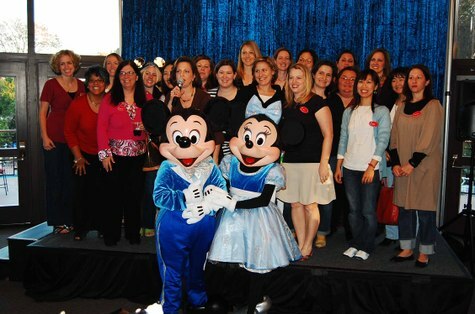 It was an inspiring, and surprisingly moving event, and one I won't likely forget soon. The event was a fundraiser for the Full Circle Fund, an innovative non-profit that links entrepreneurs, social entrepreneurs, and leaders in the non-profit sector to creative new ideas for solving social problems. They have been working on 3 focus areas up until now--technology, housing, and education. For the unveiling of their new focus area--environment--they invited Al Gore to be the Keynote Speaker at this event. The event turned out to be an awards ceremony for leaders in both philanthropy and non-profits. The theme was "You've Got the Power" with a 70's style logo, and an award that looked like a naked lightbulb sitting on a box. The first award went to Richard Goldman, a frail, elderly gentleman who was assisted to the stage by a burly young man, who I assume is either his bodyguard or his manny. He was honored for the work that his foundation, The Richard and Rhoda Goldman Fund, has done since 1955. They've awarded over $500 million in grants to various organizations focused on the environment. Goldman introduced his twin gransons, both college students, and said that he was proud of the fact that they were as committed to philanthropy as he is. He also noted that they love Al Gore, but more importantly, they love him. He went on to say that some people want Gore to run for president, which drew applause from the crowd. He added, "But I don't, because the work he's doing to save humanity is much more important than being President." I couldn't agree more. Al Gore was introduced next to thunderous applause, and he seemed to really appreciate the crowd's welcome. He looked a bit grayer and more tired than I'd imagined, but his voice was very distinctive. He started by thanking various people, mentioning the Alliance for Climate Change, his new green think tank located right here in Palo Alto. He introduced two people who now do the slide show seen in "An Incovenient Truth." One of them, a young man named Taylor, he said had done the slide show 22 times, and is only 15 years old. Gore started out his speech by saying, "I'm Al Gore." Then mumbled, "I used to be the next President of the United States." The crowd roared at this line, but he sheepishly said, "I think I need a new line." He went on to tell a story of going to a salad bar type restaurant with his business partner on his way to LAX one day, when an elderly woman started circling his table and staring at him. He finally greeted her, and she said to him, "You know, if you dyed your hair black, you'd look exactly like Al Gore." 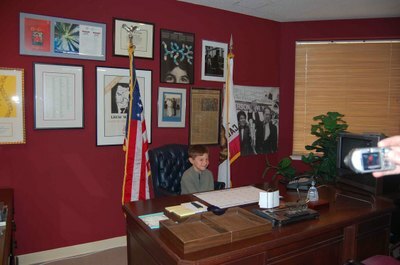 Frank, Alex and I had the opportunity to meet with Congresswoman Anna Eshoo on Friday at her Palo Alto office. We came armed with a list if items to discuss, cameras, and one fidgety 7 year-old. We explained to him beforehand what Rep. Eshoo does, and told him this was his opportunity to let her know his opinion on things. It's important to us that Alex understand that the government is there to serve the will of the people. Anna Eshoo has served in the House of Representatives since 1992. She started her career in politics through a fellowship with the Coro Foundation. She went on to work for Speaker of the Assembly, Leo McCarthy, as his Chief of Staff. Her first elected office was as a member of the San Mateo Board of Supervisors. She has spent 25 years in public service. 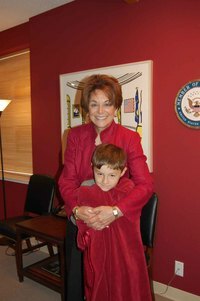 Rep. Eshoo was very gracious and friendly, and seemed genuinely interested in talking to Alex and explaining what Congress does. Frank told her about our travels, and she talked about traveling with Congressional delegations all over the world. She said that she has been to Baghdad twice. Alex was shy at first, but warmed up after a while, and started talking to her about the war in Iraq. She told him that the way Congress works, is that the President has an idea, he sends it to Congress, and the Congress makes a law to enforce the idea, if it is a good one. In the case of the war, the President didn't tell the truth about the facts behind his idea to invade Iraq. She said that when she entered Congress in 1992, she never thought she would have to vote on going to war. Alex gave his opinion on the war and said, "Well, at the beginning, there was a reason to start the war, to get rid of the King of Iraq. He was a bad guy. Now he's gone, so why can't the soldiers come home?" She asked him, "Why do you think we are still there?" Alex responded, "Because no one knows who the boss of Iraq should be." She seemed impressed by that answer. He asks a lot of questions about the war, and we try to be honest with him. We usually give him both sides of the argument, but it's pretty clear that we are not in favor of continuing to be there. Rep. Eshoo said that she has gotten e-mails and letters from people asking for Congress to bring impeachment proceedings against the President and Vice President for their misleading the people into the war. She disagrees. She said that she has been through one impeachment, and that all work in Congress stops. She believes it is bad for the country to go through this type of thing, since it tears the country apart. She quoted an article that she read that said that even if Bush deserved to be impeached, we have to "believe in our civic institutions, and impeachment is a move against ourselves." She also said that if we are visiting Washington while Congress is in session, we should call her office in advance to arrange for Alex to be taken onto the floor of the House. She is permitted to take children under 12 onto the floor while Congress is in session. Passage of additional funds for children's healthcare through the State Children's Health Insurance Program. I asked her what the best way to contact her would be, and she said, "Call me. Or send e-mail, letters, postcards...I read everything that comes in, and nothing goes out without my looking at it or responding myself. We don't send 'canned responses.' We don't weigh one form of communication more heavily than another, and we need to know what our constituents are thinking. It's hard to know what the people are thinking when you represent 650,000 people." All three of us were impressed with meeting Representative Eshoo and her hospitable staff. I feel fortunate that we live in an area with a representative who votes in a way that I would vote, who takes her job seriously, and who has spent her life in public service. If you have issues, speak up. Your representative in federal, state, and local government are there to serve you, and are more accessible than you think. It might take a while to get a face-to-face meeting, but e-mailing, calling, and writing are all effective ways to get your opinions heard. Photos: The Hon. Anna Eshoo and Alex, both taken by me.